After touring and recording with Finn Andrews (The Veils) Reb Fountain released 'Hopeful & Hopeless'; "the most perfect EP ever made," (Simon Wilson, Metro). The album, recorded live at Auckland's Wine Cellar, recently won a Tui award for Best Country Album 2018 and title track, 'Hopeful & Hopeless' won APRA Best Country Song 2018 and it doesn't end there! The much awaited follow up, Little Arrows, featuring the late Sam Prebble was nominated for Best Folk Album 2018. 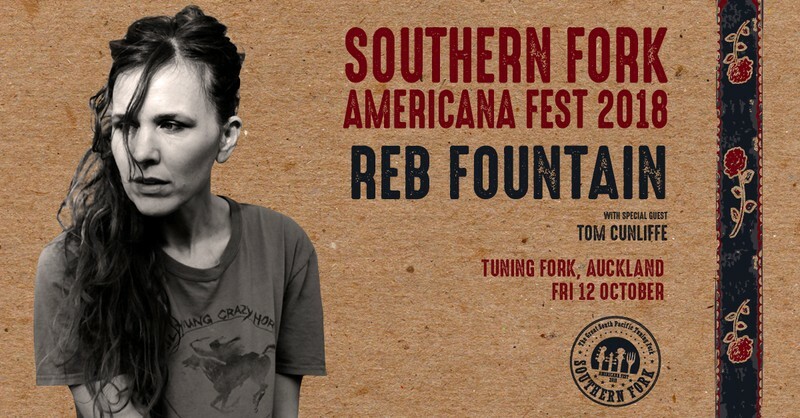 "Reb Fountain is to be counted among our finest songwriters whose imagery is both personal and universal, and her command of a melody and a song transcends genre." (Graham Reid, Elsewhere). Auckland-based folk artist, Tom Cunliffe, recently released his second album, Template For Love, following his debut Howl and Whisper. In his late teens Toms love of typography drew him to Wellington, where he studied design. It was here that he first started playing guitar and writing songs. Howl and Whisper was recorded in Lyttelton with producer Ben Edwards and was praised for its diverse songwriting and compared to The Waterboys and Bob Dylan.